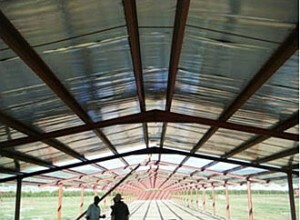 A highly durable radiant barrier developed specifically to provide a lining material for improving the environment inside poultry houses is now being introduced to countries around the world. The Valéron AVA laminate has two highly reflective aluminium surfaces which optimises energy usage, helping to keep poultry cool in hot climates and conserving heat in colder zones. “The first installations are achieving results that demonstrate clearly its value and this is attracting interest from a number of countries,” says Allan Meldrum, director of Food Chain Innovation, which is supplying the product globally. At this farm the walls and ceiling were lined with Valéron AVA, the tough, smooth aluminium laminate which is easy to sanitise. The material is manufactured in the UK and Belgium by Valéron Strength Films to seal units from air leakage and moisture, and enhance climate control and airflow. 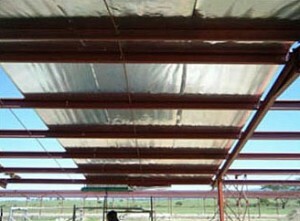 In hot climates the heat reflecting properties of the lining are achieving very significant temperature decreases and also enhancing bird performance through improved airflow and ventilation, says Allan Meldrum. Mr Meldrum says the product is now being introduced both to renovate older buildings — the Essex farm is more than 40 years old — and for new state-of-the-art housing where it is particularly easy to install. Food Chain Innovation is a joint venture between Allan Meldrum and Jim Johnston, two widely experienced entrepreneurs in the global poultry business, set up to bring innovative technology to the food chain from other industries.